Love is in the air when February rolls around, and London is a great place to experience it. Most people might think that Paris would be the best place to spend Valentine’s Day, but the UK capital has a charm to rival its competition across the Channel. If you’re in London on February 14th, you might want to consider one of the ten places below to spend the holiday with someone you love. From fine dining to wonderful views, each one will create wonderful memories you’ll share together. 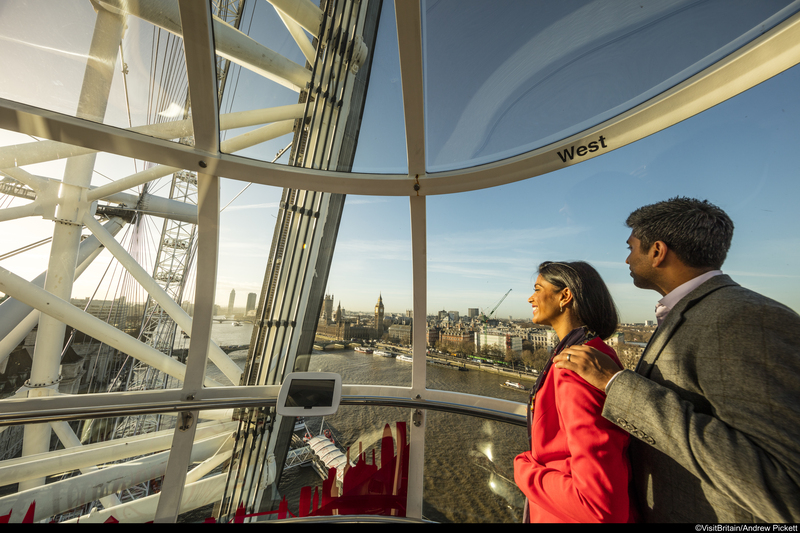 Getting a bird’s eye view of London is just one way to find romance in the city. Several companies will fly you over the choicest spots in London, taking n beautiful views of the parks, towers, and famous landmarks. Just be aware that the weather will certainly play a factor in these plans and be sure to have a backup plan in case it doesn’t work out. Certainly one of the prettiest spots in London between the greenery and the canal boats, Little Venice can be found at the junction of Regents Canal and Grand Junction Canal. Besides the prettiness of the area, walking along the canal will find you any number of things to do including restaurants, museums, pubs, and cafes. Much like the helicopter tours, many companies charter boat tours along the River Thames. Whether you’re looking for a leisurely trip down the river, something historical, or even a tour with a little action in mind, you can find the right tour for your needs. It’s also recommended to find a tour that starts around sunset for one of the most beautiful views from the river. With its lavish deco interior, Soho restaurant Bob Bob Ricard certainly has the ambiance you’ll be looking for when it comes to a romantic dining experience. However, that isn’t the only notable thing about this luxury Russian and English eatery. Every table is equipped with a “Press for Champagne” button so you can make the evening truly special whenever you wish. If you’re wanting to take your sweetheart for a stroll amongst the flowers, Kew Gardens is one of the best places in London to do it. A botanical garden that hosts one of the “largest and most diverse” collections in the world, Kew is bound to have their favorite flowers somewhere. There are also a number of great attractions in Kew such as the Treetop Walkway, the Pagoda, Queen Charlotte’s Cottage, and Kew Palace. While it doesn’t have the biodiversity of Kew, Hampstead Heath is a public park that has something else worth taking in—a view. While the woods and ponds are certainly lovely themselves, what really draws people is Parliament Hill, which offers one of the highest natural views of the city. It’s the perfect spot for a picnic to celebrate the day. 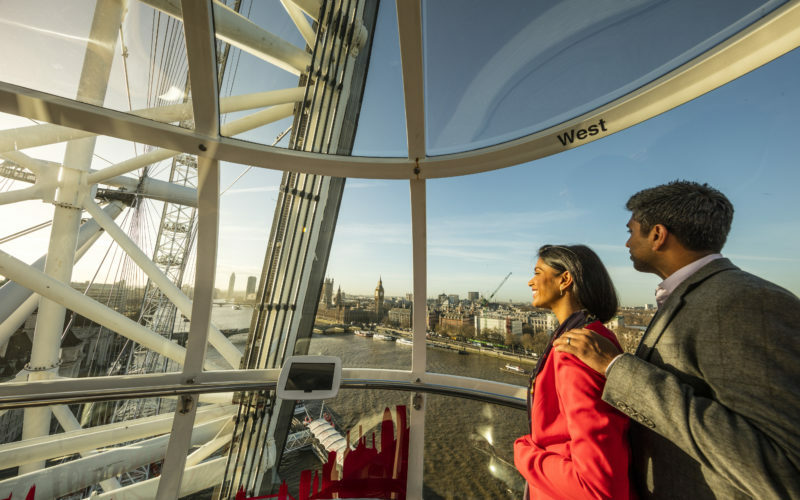 And speaking of views, the London Eye offers a unique chance to see the city as your spin around the cantilevered observation wheel. Dubbed “flights,” each trip lasts about thirty minutes and can be booked as a group, or you can reserve a solo flight for a greater cost. For a bit more money, you can opt for champagne or chocolate with your flight. Hyde Park is the largest of London’s four Royal Parks at 350 acres, which means there is a lot to see and do throughout on your romantic visit. Whether you two like debate and want to take in Speakers’ Corner or wind around the Serpentine lake, there are romantic activities to suit all types throughout Hyde Park. Several hotels also border the park with great views onto it, so consider booking one of them to have a beautiful view every morning. You don’t have to be a fan of the same-name film to appreciate all the romantic spots this part of London has to offer. Of course, you can visit the famous blue door, but there’s also the lovely Portobello Road Market and the eclectic bar Beach Blanket Bingo. For a full day of it, also consider dinner and a movie at the adjoining Electric Cinema and Electric Diner. The Shard may not seem like a top romantic spot for Valentine’s Day, but with all it has to offer, it may be a one-stop shop. Stay at the Shangri-La hotel, dine in the restaurants, and even take in the tallest view of the city from the building’s observation floors. Even if you don’t opt to spend more than an hour or two of your Valentine’s Day here, it can still be your base of operations for anywhere you visit in London. If you chose Hampstead Heath don’t miss eating at Spaniards Inn. I dream of that place..